As part of its latest wave of program announcements, the Toronto International Film Festival(TIFF) has revealed the contents of its City to City: Seoul focus as well as other programs. Eight titles will screen in the section, while two more Korean features and one more short were also part of yesterday’s notice. 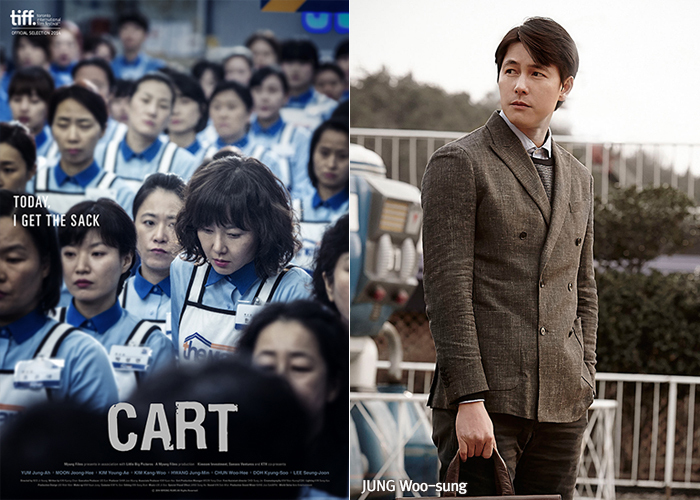 Two films will have their world premieres in the City to City: Seoul program: the supermarket drama Cart, from Sisters on the Road(2009) director BOO Ji-young and starring KIM Gang-woo, MOON Jeong-hee and a host of others; and Scarlet Innocence, the JUNG Woo-sung drama that marks the first feature-length directorial outing for YIM Pil-sung since 2007’s Hansel and Gretel. Among the rest of the selections, July JUNG’s drama A Girl at My Door and KIM Seong-hun’s thriller A Hard Day both debuted at the Cannes Film Festival, PARK Jung-bum’s feature-length Jeonju Digital Project Alive and ZHANG Lu’s Gyeongju both had their international premieres at the Locarno International Film Festival and Kelvin Kyung Kun PARK’s documentary A Dream of Iron debuted at the Berlin International Film Festival. Completing the lineup is the recent thriller Confession, from first time director LEE Do-yun. TIFF will stage a special City to City: Seoul party during the festival which will be co-hosted by the Korean Film Council(KOFIC). In addition, Korea is expected to field a significant delegation for this year’s industry programming including the Asian Film Summit, which will take place on September 9. Meanwhile, Albert SHIN’s Canada-South Korean co-production In Her Place will screen in the Discovery program, reserved for up-and-coming filmmaking, while the USA-South Korea-Portugal co-production Songs from the North, which debuted at the Locarno this month, will screen in the Wavelengths section, dedicated to documentaries, along with KIM Kyung-man’s short Beep. This latest set of announcements brings the total amount of Korean films at TIFF to 14, as they join the Gala Presentation for Haemoo, co-written by Bong Joon ho, and IM Kwon-taek’s Revivre and HONG Sangsoo’s Hill of Freedom, both screening in the Masters section. The 39th Toronto International Film Festival will unspool over September 4 to 14.